Lavender oil is my favourite of all the essential oils. The smell of the real oil can lift you out of depression* and take you to a place of peace. A true oil free of chemicals is very calming, uplifts the spirit and is second to none when applied directly on a wound. A minor cut will heal quickly and with no infection or scarring. Lavender oil will also reduce the pain of the injury. *If you have a medical condition please seek the advice of a qualified health care practitioner. There is a significant problem in obtaining quality oils. Let me give an example. Today much of the lavender oil sold in North America is obtained not from lavender, but from lavendin, grown and distilled in China, Russia, France and Tasmania. 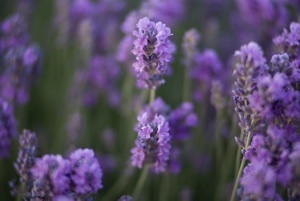 Lavendin produces 10 times as much oil as lavender so it is much cheaper but it is also substantially different. Lavendin oil contains a caustic compound called camphor. You can use lavender oil to heal even a third degree burn whereas lavendin oil will intensify the burn. So the lavendin growers heat their oil up to 17,000º C to “flash off” the camphor. In the process the oil is fractured and becomes therapeutically useless. Lavendin oil doesn’t smell quite the same as lavender oil, so the growers add up to 6% synthetic lenolol acetate and then market their product as pure lavender oil. It is a total scam. This type of thing is happening with many oils all over the world. The result is you cannot trust the label on the bottle of oil you want to buy. You really have to know who you are buying from and how the plants were grown and processed. It is the reason why I use Young Living Essential Oils. The demand for essential oils world wide has outstripped the supply and the pressure to use chemicals and high temperature / high pressure production methods is enormous. Small companies still have to compete with big time buyers on the world market and price rules. Big time. Young Living Essential Oils – my all time favourite.